In this paper, we analyse the earnings and employment probabilities of men by education level, birth cohort and age in the United States, Canada and Australia using a series of cross-sectional surveys for each country spanning the years 1982 through 1996. For all three countries, more recent birth cohorts of less-skilled men have experienced worse labour market outcomes than men from the same skill group but of earlier birth cohorts, ceteris paribus. In the United States, the deteriorating labour market outcomes appear as lower earnings but not lower employment probabilities. In Canada and Australia, the less skilled men from more recent birth cohorts experience lower employment probabilities and lower earnings, with the magnitude of the earnings decline by cohort being smaller than was the case for the U.S. This is consistent with the hypothesis that labour market institutions in Australia and Canada have prevented wage levels from declining sufficiently to avoid the need for reductions in employment probabilities. In the United States, wage flexibility may have removed the need for reductions in employment probabilities. McDonald, James Ted, & Worswick, C. (2000). 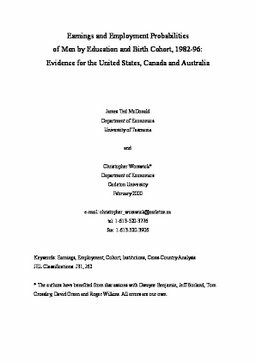 Earnings and Employment Probabilities of Men by Education and Birth Cohort, 1982–96: Evidence for the United States, Canada, and Australia (No. CEP 0-04). Carleton Economic Papers (CEP). Department of Economics.